Here's my 76 year old client LIZ! She can also do 20 pushups and she uses 30 pounds for her chest presses! Quite impressive. I began my fitness career in 1981 and continue to love my job. 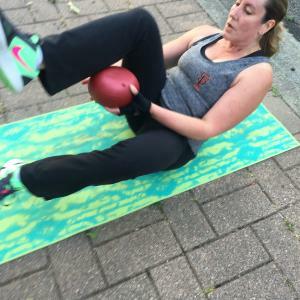 I began as a Group Exercise Leader and still teach a variety of classes such as: Tabata Bootcamp/Circuit, Strength and Conditioning, Step, Total Body Circuit Training, Functional Core Fitness, General Exercise, HIIT, Interval Training to name a few. I also have an IN HOME personal training business called SueD-Fit.I am certified with The American College of Sports medicine. I can either come to your home or train at a private studio. I believe that my service is extremely valuable for all fitness levels from beginners to advanced. I will design and implement a program just for you, depending upon your needs and goals. I am very professional and respectful of your time and commitment. I am the Co-Owner of Pinole Valley Bootcamp and the owner of D-Fit Outdoor Workout. Pinole Valley Bootcamp is a six week, one to three day a week outdoor program located in Pinole California. D-Fit Workout is an ongoing outdoor workout in the North Berkeley area of Northern California. I challenge and "nudge", encourage and persuade you to work just a bit harder than you think you can. Each bootcamp is designed with success in mind, it is designed to work your entire body each time, and being outdoors is a bonus! I am an ACE Certified Health Coach. Health Coaching allows individuals to set personal, realistic goals. Health Coaching allows me to assist my clients to achieve success and lifetime habits. Generally we work for 12 -25 weeks, depending on the needs, commitment, and stage of readiness. I have had great success with my Health coaching clients, they have all reached the goals they have set and continue to do so! I am a Fitness Business Consultant for every aspect of the fitness industry. I will assess your club, gym or studio depending on the needs of improvement.I can start from your front desk personnel to your staff, your group exercise schedule, your instructors abilities and capability to follow specific guidelines and program design. I will also observe your trainers while they train and I will then analyze and outline areas that need improvement and fine tuning in order for your club to become more successful. I am a very seasoned professional with thirty two years of experience. I have a Group Exercise Leader Certification with ACSM and Personal Training with ACSM and am also a Certified Tabata Bootcamp Instructor. Along with my Health Coaching Certification I am able to personalize a fitness program along with a lifestyle and weight management program to fit anyone's needs. If you want to try something new, if you are new and don't know how to start, if you are a fitness club owner and want to get down to the nitty gritty of what it really takes to run a club, please contact me. ... read more.